When I was promoted to Program Coordinator for MPOW back in August 2006 my job changed in many ways, and one of them was the volume of voice mail I received grew exponentially almost overnight. I have never been a fan of voice mail, so to go from getting 3-4 messages per day at most to getting 15-20+ on most days made me unhappy (and somewhat disorganized) for several months. I struggled with how to keep track of all the messages and worried constantly that I had not returned a call or had left a task undone. I found I was constantly scribbling a message on a scrap of paper or on a post-it note then losing track of who I had called and when — or, worse still, misplacing the scrap of paper with the message and then wasting time looking for the scrap. It is more than obvious if you have ever heard me speak that I am a big fan of 2.0 web tools and other online freebies to keep myself organized. I simply could not live without Jott to send myself reminder messages on the commute to work or without all the assorted lists for packing, Christmas shopping, house projects, etc that I have stored on Ta-da Lists. I am an avid user of Google Docs and Calendar and can’t imagine what I would do without sites like SlideShare and Doodle. Still, in all this 2.o goodness I could not find a simple and effective way to keep my voice mail under control. 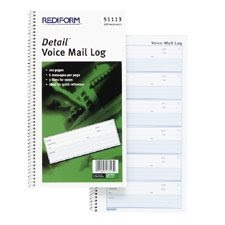 Then I stumbled upon a simple office supply item that has been my savior for the last 15 months – the voice mail log. I know this is not rocket science and it is more than likely that many readers have been using VM logs for years, but I have shown mine to a few people lately who had not heard of them or used them and they are now proud and happy owners of their own log books. Now, you don’t need to actually buy a VM log (a simple dedicated notebook could do), but the way the log is set out it really allows you to record every transaction in completion and it can even act as an archive for future reference. Also, for less than $4 the price is nothing to quibble over. The exact log that I use is pictured here and I have filled a few of them in the last year. I have my own code that I have developed for detailing each transaction and I leave a notation for when I called back, action taken, decision made, etc. I also like that there is a check box for when I am done with a VM. I am a list maker and I like crossing items off my lists so the VM log satisfies this need. I find that I also use it as a rolodex and impromptu phone book. I am constantly looking up numbers in my VM log as it sits right next to my phone and on more than one occasion I was able to sort out possible problems based upon the notes in my VM log. I can tell you exactly when an author first contacted me about speaking, I write down dates and times for programs as a back up to the shared programming calendar (which sometimes has entries go missing since more than a dozen people have access), and it also quantifies what I do with my day. While I prefer to use chat/IM, I know that most of the people I work with to book programs prefer the telephone so I have to accept VM as a part of my job. It is highly unlikely that I will ever like communicating via voice mail, but at least I have found a way to make it manageable and I have even found unexpected benefits all because of my oh so 1.o VM log. If anyone has a better solution for voice mail, I would be happy to hear about it. Also, I would be interested to hear what paper-based office solutions you just can’t live without. Entry filed under: Uncategorized. Tags: organization, voice mail. A Friday Fun TwoFer	Keeping up with Internet Stats: Some of Robert Lackie’s Favorites—What are yours? I’ve been using a voice mail log book for a couple of years now and like you, it’s made a huge difference. I don’t get near as many voice mails as you do, but I like that I can look back through it to find previous information. I also use it to jot notes when I’m talking on the phone. The one I use is from TOPS, which is available from Corporate Express if anyone has a contract with them. I don’t really have a different suggestion, but a supplemental one. The book Getting Things Done by David Allen takes a really simple (but amazingly effective) approach to organizing all your incoming stuff which would apply to voicemail The email management tips from this book have made a huge difference in my world. The paper-based office solution that I can’t live without is my calendar. I have a Google Calendar and a calendar in Outlook, but I love my paper calendar. It lays out my entire week at a glance, with hourly slots so I can track appointments and stuff. If it’s not on my calendar, it doesn’t get done! Eventually, I do make sure everything gets into the Outlook calendar, but it usually starts on the paper one.